For slicing and cutting lumps of clay, and cutting pots off the wheel. Very strong stainless steel twisted wire is firmly fastened to hardwood toggle handles. 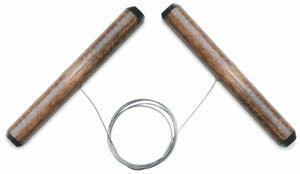 Hardwood 3¼" (8 cm) toggle handles, firmly fastened to 18" (46 cm) of very strong, stainless steel twisted wire.